Just over 18 months ago, I met two students at the March Meeting of the International Federation of Medical Student Associations (IFMSA). They were frustrated by their own experiences of running into paywalls while trying to read research articles and were determined to do something about it… they just weren’t quite sure what exactly. In the wee hours of the morning one month later, inspiration struck, and the idea for the Open Access Button was born over email. The email that started it all... received at 2:25am. The two students—David Carroll, a medical student at Queens University Belfast, and Joseph McArthur, a pharmacology student at University College London—wanted to change the experience of hitting a paywall, to transform it from a disempowering denial of access to an explicit call to action. The idea: to create a browser-based tool that would record users’ collisions with paywalls and aid them in finding freely accessible copies of research articles. David and Joe recruited a talented team of student volunteers and developers from around the world to help build the Button, and seven months later, the Open Access Button was launched. In less than a year, these two students went from learning about Open Access for the first time to launching a tool which was covered by the Guardian and Scientific American when the beta was released at the Berlin 11 Satellite Conference for Students & Early Career Researchers last November. Since then, the Open Access Button has mapped nearly 10,000 collisions with paywalled research articles and continues to gain both use and notoriety, having been hailed by the likes of the Dutch State Secretary for Science and Randy Schekman, the 2013 Nobel Laureate in Physiology or Medicine. The core student team has grown to more than twenty volunteers who run the project at a professional level. They’ve done the hard work of building something from nothing, successfully securing funding from groups like JISC and the Right to Research Coalition and in-kind development from the great team at Cottage Labs. And they’ve done it while being full-time students. Tomorrow, all of that hard work will pay off with the release of a new, much more powerful Open Access Button. You can watch the launch live at www.openaccessbutton.org beginning at 1pm EDT / 6pm BST. While there are many improvements and additional features, one in particular could be revolutionary. Upon hitting a paywall, the new Open Access Button will automatically email the corresponding author of the article on the user’s behalf, letting them know someone unsuccessfully tried to read their work and requesting a link to a freely accessible copy of the manuscript (preferably from an institutional repository). Then, if the author responds with a link, the Button will not only provide the link to the original user, but it will also serve the link to any person in the future looking for that article. In this way, the Open Access Button has the potential to serve as a powerful pull mechanism encouraging authors to deposit their work into repositories. While David and Joe and the student team they lead are exceptional, they are not the exception. That’s the most exciting thing about working with students and early career researchers. Their creativity, passion, and energy not only generate fantastic ideas but also see them through to completion. 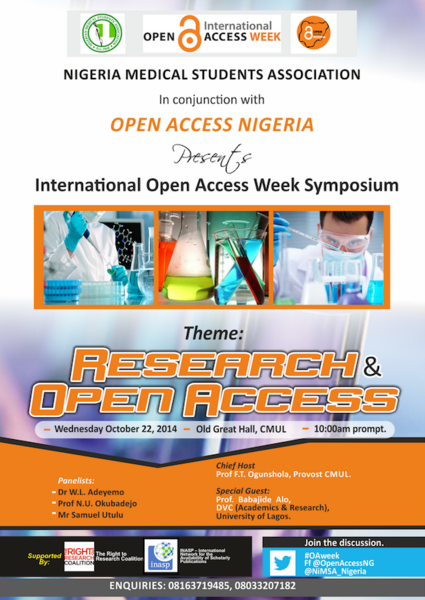 Students and early career researchers around the world are already leading the charge for Open Access. In the past year alone, national-level campaigns have been launched by students in Nigeria, Nepal, Tanzania, Sudan, and beyond. Ahmed Ogunlaja founded Open Access Nigeria after attending the Berlin 11 Satellite Conference last November, and the student organization has already established chapters at universities across the country and will lead Open Access Week celebrations on 19 campuses this week. Roshan Kumar Karn founded Open Access Nepal following the same meeting in Berlin. Open Access Nepal is already running Open Access advocacy campaigns across 10 campuses in the country and has facilitated meetings with the Nepalese Minister for Education, Secretary of the Health Ministry, and Members of Parliament to advocate for Open Access policies at the national level. Beginning today, Open Access Nepal will host a three-day conference that will bring together students, librarians, faculty, leading government officials, and others to raise awareness about Open Access and develop a plan for accelerating the Open Access movement in Nepal. 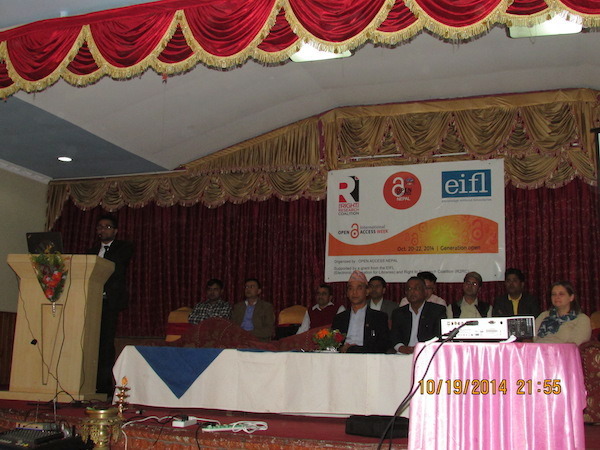 A photo from the first day of Open Access Nepal's conference this week. In the United States, the National Association of Graduate-Professional Students (NAGPS) is pushing for Open Access to be a policy priority for those running for the United States Congress in November’s mid-term elections. Jesse Kremenak, NAGPS’ Director of Legislative Affairs, is running an “Educate the Vote” campaign which asks candidates across the country for their stance on Open Access, among other issues, signaling that OA is a priority for American graduate students. Universities Allied for Essential Medicines, another Right to Research Coalition member, has integrated Open Access into its Global Health Research Index, which will grade institutions based on their commitment to making research outputs globally available. Led by Chris Counts, the effort will evaluate universities based on the extent to which they promote and facilitate Open Access publishing by their researchers, and the impact of such efforts as calculated by the amount of research output that is freely available online, in full-text format. This afternoon, the panel at the SPARC-World Bank International Open Access Week Kickoff Event will be led by Meredith Niles, a Postdoctoral Fellow at Harvard University and former Director of Legislative Affairs for NAGPS. Meredith played a key role in passing AB 609, the state-level Open Access bill in California, by organizing students and testifying before the California State Senate. Meredith was also recently appointed to the Board of Directors for PLOS. While these individuals are still beginning their careers, they’re already beginning to change how scholarship and science are shared. And for each individual mentioned, there are countless others leading their own projects and yet more still who lead by example, making their own work openly available and encouraging their colleagues to do the same. This year’s Generation Open theme for International Open Access Week celebrates these significant contributions that students and early career researchers are already making within the Open Access movement and highlights their importance as future faculty, administrators, publishers, and policymakers. Just as Open Access Week has continued to grow since students partnered with SPARC to found it in 2007, it will be exciting to watch the impact the next generation of scholars and researchers has in making Open Access the new default as they launch their careers, publish their own work openly, and make their voices heard.